Internship: Deep Brain Stimulation – Deutsche Neurowissenschaften-Olympiade e.V. I did an internship at the Charité in Berlin from 17th to 28th of July. There, I was able to join Prof. Kühn’s team which inquires several aspects of movement and movement disorders with a focus on Parkinson’s disease (PD) and dystonia. Furthermore, I could spend time at the neurology ward observing many patients either suffering from movement disorders, stroke – both main research subjects at the Charité – Multiple Sclerosis, and other rare sicknesses. Prof. Kühn’s lab does intense research on deep brain stimulation (DBS) especially in patients with PD. On the first day of my internship, I participated in a consultation hour for people having PD and were already receiving DBS. It is very imposing to see how little changes in the stimulation setup could have such a strong impact on the patient’s symptomatic state. However, there was one Parkinson patient in an extremely bad constitution, for whom no stimulation changes could have helped. This was possibility due to him having a genetic component to his disorder, causing an early onset of his PD at the beginning of his forties. 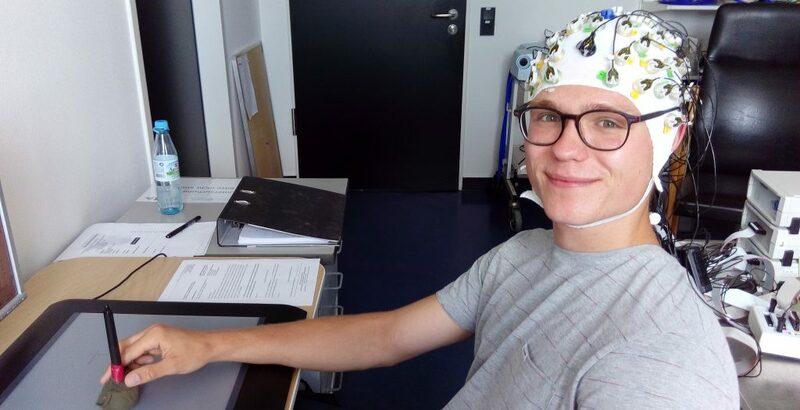 After the consultation hour, I was a probed and participated in a brain-computer interface experiment myself. I wore an EEG cap and tried to tap colorful dots on a computer screen. If the dots were green the cursor moved the same direction as my hand, but in the red condition the cursor moved the opposite direction. The group of people there doing this experiment wants to understand which areas of the cortex are involved in planning and executing voluntary movements. For this, they analyze the reaction time, for instance. On the second day of my internship, I joined the visitation round at the neurology ward where I had the opportunity to see patients diagnosed with different types of neurological disorders. I saw one patient with a Brown-Sequard-Syndrome, a cluster of specific symptoms arising from a spinal lesion. It was kind of interesting to see this one because all the symptoms were textbook-like as if it was a case study of a medicine lecture at university. I saw another patient who was a narcoleptic, having uncontrollable episodes of falling asleep during the day time. Narcolepsy is a very rare disease and it was a privilege to have the opportunity to observe and interact with this patient. Another patient, had an unknown neurological disorder, which the doctors where trying to diagnose. Speaking with the attending physician, they hypothesized and where testing to see if this patient could have an extremely rare sort of autoimmune encephalitis attacking her NMDA-receptors. Knut the polar bear died from this same disease. On Wednesday, there was another visitation round. For this round, I walked through the patient’s rooms with the chief doctor, Prof. Endres. We consulted mainly stroke patients because Prof. Endres is an expert at this area. Then, I spent some hours in a consultation session for people who complain about movement troubles. It was about diagnosis and learning about diseases like dystonia or essential tremor. Some of the people seemed suitable for a DBS implantation, so they got appointments at the neurology ward to be evaluated. A majority of Prof. Kühn’s team mainly is treating patients with DBS implanted in an area of the basal ganglia called the subthalamic nucleus or STN. The stimulation of STN inactivates this nucleus to treat the bradykinetic aspects of PD mainly. The researchers use the inserted electrodes as long as they are externalized, i.e. when the stimulator is not yet implanted. They do so called “local field potentials” or LFP, which is like an EEG, but where very small neuronal populations can be observed. The team uses this data to understand the pathoelectrophysiology in PD, to optimize the function of DBS one time, and to predict exactly the state of an individual PD. On Thursday of the same week, I had the chance to take part in a surgery where the electrodes for DBS were implanted in a Parkinson’s patient only in his forties. He had to be completely narcotized because his on-off phases were too strong to control. The on-off phenomenon occurs in people who are treated for a long time and/or with a high dose of L-Dopa. Regardless of the intake of the drug, these patients experience phases of hyperkinesia alternating with akinesia throughout the day. These symptoms prevented the surgeon from operating the patient in consciousness during what is normally done to assess the localization of the electrodes. Nevertheless, I could watch the team testing the electrodes to estimate the most perfect and probable effective localization. I listened to the amplified sound of neurons firing spontaneously in the STN and Substantia nigra. They sound surprisingly different. However, it is astonishing to hear neuronal activity deep in the brain of a fully narcotized patient! Then, they increased the voltage until one could observe the side effects of the stimulation. On one hand, you need this to evaluate the position of the electrodes, on the other hand the doctors need to know how high they later can turn the voltage in the implanted stimulator. The side effects are commonly known as the „capsule effect“ due to the cause of the involuntary movements that result from a arousal of the internal capsule which lies very close to the STN. The deeply „sleeping“ man blinked his eye and moved his fingers! That was barely imaginable to me before. But, the brain’s function base on electricity and the inserted electrodes provide electricity to the brain. On Friday, I walked with a young doctor that really took care to explain to me as we went through the neurology ward. I really want to be a clinician doing research. So, I enjoyed the time in the clinic a lot. While in the clinic, I was even able to do a neurological examination of the cranial nerves, of course under the careful eyes of a doctor. The second week of my internship started again with some hours on the ward. After that I joined some members of Prof. Kühn’s team doing the LFP and physical examination of the patient who was implanted the Thursday before. The appearance of the patient impressed me a lot. I saw him the week before suffering from that strong on-off symptoms I mentioned above. He could move almost normally except with a slightly shuffling gait. All those improvements without a stimulator! That means his electrodes were still externalized. Those temporary improvements are known as „put effect“. Inserting metallic needles could be a means of agitation to the brain tissue causing a light edema, which results in the improvements seen in this patient. Later in the week, during a visitation round, I met a patient with Susac’s syndrome. That is a special kind of vasculitis affecting the small blood vessels in the brain, the retina and the inner ear. This young woman laughed uncontollably because of the localization of the lesions in her brain. As a follow up, I watched video footage of the experiment that was done on me on my first day. During my initial recording session, I was not told about the underly purpose of the project because of fear that I might be biased by the explanations, which could have had a negative effect on the data. Therefore, during video review, the psychologist responsible for this research project was now able to tell me more about her research. The next day, two more researchers told me about their work. One of them developed a computer program called leadDBS. It enables brain scientists to assess the exact position of DBS electrodes in 3D. For this, they use postoperative MRI images which are converted by complex algorithms into a „normal space“ that is called MNI brain. This simulation arises as an average healthy brain that was created by canadian scientists some years ago and bases on MRIs of several hundred individual brains. Researchers all over the world work with this program to create databases regarding the best point of stimulation in STN and to predict the response to a stimulation without really stimulating the patient. On my last day of my internship, I again participated in another consultation hour. During this session, I saw a young woman freshly diagnosed with Huntington’s disease which was really hard to cope with – even for me as a bystander. Then, I went to the lab for the last time and watched a brain-computer interface experiment with one dystonia patient implanted for DBS. The experiment was similar to the one that I participated in, but this time the patient had to tap the green and red dots once with his DBS turned off and once when turned on. The scientist then compares the reaction and movement times. The site of stimulation in dystonia patients is the Globus pallidus internus (Gpi) which results in interesting effects. For instance, the reaction times are similar to healthy patients but movement times are delayed with on-stimulation because the Gpi marks the basal ganglia output and is dampened down by DBS. The Gpi signal is needed, though, to start a voluntary movement. In conclusion, I can say that this time at the Charité Berlin and Prof. Kühn’s lab really enriched my opinion towards my way in life as well as my knowledge, of course. Aditionally, it was great to gain an insight into scientific work, which we all depend on and is clinically relevant to many patients around the world.